Blending impeccably charming writing, sensational character design, a touch of class and a mountain of heart, Monsters, Inc. proves that Pixar has a sincere eye for practically every single audience imaginable. All the while when they're presenting a new, fresh picture with blasts of color and fun-filled characters within a compact but warming storyline, their sense of humor never forgets that adults are watching as well. In fact, as with many of Pixar's films, it's arguable that it might be the most adult-minded of their productions -- not for the sense of humor, which rustles gut-level laughs on at least a handful of occasions, but for the context of its world. Though it's a simple computer animated feature with meager aims, few can rouse cheek-to-cheek grins to such a delightfully consistent rhythm. 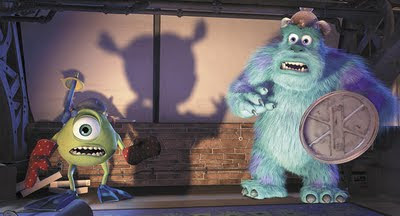 Monsters, Inc. takes place in Monstropolis, sort of a parallel universe to ours. There, its citizens are monsters dealing with an energy crisis, since the power company, Monsters, Inc., struggles to meet the needs of the city. The problem? They scare the living daylights out of kids in our own universe through a warehouse full of doors that work as gateways, then bottle up their screams and light up their streets and homes -- yet kids are growing harder and harder to scare nowadays. Employees Mike Wazowski (Billy Crystal) , a short, round, green Cyclops that reminds one of a basketball, and giant Chewbacca-level furry creature Sulley (John Goodman) aren't mean creatures (quite the opposite, actually, since their absolutely delightful) but merely sharp-toothed, gangly eyed guys working 9 to 5 together on a factory floor for the improvement of their town. Better yet, they actually believe the children to be toxic little entities -- which, of course, is quite the stretch in logic. Wink, wink. Pixar's creative vein really begins to flow with Monsters, Inc., the company's fourth major motion picture. With the Toy Story series and A Bug's Life, they used everyday environments and brought them to life in magical ways, but their thinking really turns on its ear with the creativity pumping behind Monstropolis. A universe has been created from the ground up, one that involves a world mirroring ours only with a few, well, tweaks. 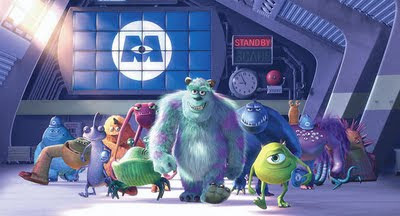 Office relationships exist in the Monsters, Inc. workplace, between "googley bear" Mike and his Medusa-inspired girlfriend Celia (Jennifer Tilly), while competition ignites between Sulley and his slithering competitor Randall (Steve Buschemi) under the watchful eye of mentor and Monsters, Inc. CEO Mr. Waternoose (James Coburn). Of course, this competition comes back to haunt them when a mistake on the floor lets a human child out -- and right behind Sulley's back. That's where the true humor behind Monsters, Inc. really ignites, as Sulley and Mike try to hide their new little human friend, "Boo", until they can find a way to send her back through the door to her bedroom. Verbal double meanings and situational goofiness run amuck, while a genuine heart beats at the center of the relationship brewing between the big ole' scary monsters and their "victim". The writing is really impressive in that respect, striking a balance between physical and verbal humor that jives well in both age groups, while carrying a direct sense of warmth underneath Sulley's almost parent-like attachment to his little friend. It's heartwarming when "Boo" gives Sulley a nickname -- "Kitty" -- after he's the odd man out during Mike and Celia's gushiness, giving the big, bashful lug a sense of happiness while he's scaring the daylights out of kids for a living. Though the Pixar creative team have done an astounding job with the visual construction of Monstropolis and the logistics of the scream factory, Monsters, Inc. wouldn't be nearly as spectacular without the pitch-perfect vocal casting. Billy Crystal embodies the little, round Mike Wazowski with the right level of erratic chaos that he's brought his live-action characters, playing off of John Goodman's affable styling with Sulley impeccably. Chunks of the slapstick Laurel and Hardy dynamic can be seen in their welcoming dynamic, along with glimmers of Dean Martin and Jerry Lewis for good measure. Yet, they've got their own mannerisms that make Mike and Sulley their own personalities, transforming them into another successful comedic duo for the books. It doesn't stop there, though; along with James Coburn voicing Mr. Waternoose with the right raspy age, Jennifer Tilly's sweet yet hissing disposition as Celia, and an only mildly-recognizable turn from Steve Buschemi as the slithery, cutthroat Randall, the rest of the cast land their roles beautifully. Not to mention Boo, who absolutely bubbles with cheeky youth as she sings intelligibly in an echoic bathroom and screams at the top of her lungs when she can't have her little stuffed animal. Once Monsters, Inc. gets started down the pathway of quick-paced scrambling and physical humor through their slips and follies, it never stops until the upbeat credits roll. A sense of simple immediacy -- getting a little kid home safe and sound -- coasts the picture amiably to the finish, allowing for the inspired visual design and pitch-perfect vocals to cast a spell on the audience. Boy, does it work, leaving us with tender moments and laughs abound as some rather exciting chases, including the final door-dangling wrap-up, that send our trio blitzing all across Monsters, Inc. and Monstropolis. Moreover, its quirky little twists and sappy turns at the end are sublimely executed, simply adding onto its crowd-pleasing lovableness in the 11th hour. Monsters, Inc. is a straightforward story gushing with excitement and unbridled joy, giving us fistfuls of laughs and smiles throughout its cleverness. And that's just for the adults; but don't worry, the kids'll eat it up too.